The ocean sunfish, Mola mola, or common mola, is the heaviest known bony fish in the world. It has an average adult weight of 1 tonne (2,200 lbs). The species is native to tropical and temperate waters around the globe. It resembles a fish head without a tail, and its main body is flattened laterally. Sunfish can be as tall as they are long when their dorsal and ventral fins are extended. Sunfish live on a diet that consists mainly of jellyfish. Because this diet is nutritionally poor, they consume large amounts in order to develop and maintain their great bulk. Females of the species can produce more eggs than any other known vertebrate. Sunfish fry resemble miniature pufferfish, with large pectoral fins, a tail fin and body spines uncharacteristic of adult sunfish. Adult sunfish are vulnerable to few natural predators, but sea lions, orcas and sharks will consume them. Among humans, sunfish are considered a delicacy in some parts of the world, including Japan, the Korean peninsula and Taiwan, but sale of their flesh is banned in the European Union. Sunfish are frequently, though accidentally, caught in gillnets, and are also vulnerable to harm or death from encounters with floating rubbish, such as plastic bags. A member of the order Tetraodontiformes, which also includes pufferfish, porcupinefish and filefish, the sunfish shares many traits common to members of this order. It was originally classified as Tetraodon mola under the pufferfish genus, but it has since been given its own genus, Mola, with two species under it. 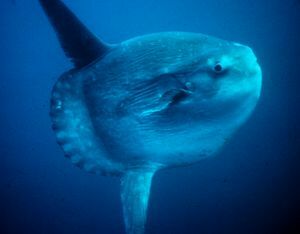 The ocean sunfish, Mola mola, is the type species of the genus.